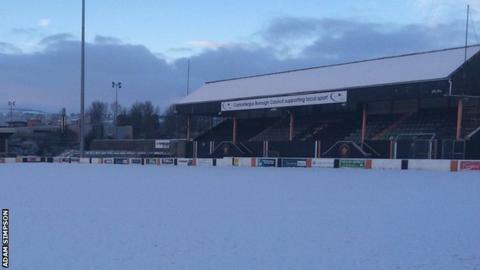 Four of Saturday's six matches in the Irish Premiership have been postponed because of snow and frozen pitches. The fixtures off are Cliftonville's match against Glenavon, Linfield's trip to Carrick, Ards versus Ballymena and Glentoran's game with Ballinamallard. The two matches which are on see leaders Coleraine host Dungannon Swifts at the Showgrounds and Crusaders travel to Warrenpoint Town. No pitch inspections are planned at these two grounds. Limavady United's game at home to leaders Ballyclare Comrades is the only fixture still on in the NIFL Championship, and all matches in the Premier Intermediate League are off.